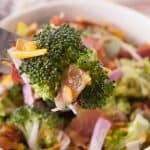 This tangy broccoli salad is a must have! It has very few ingredients but is packed with flavor! Perfect for picnics, potlucks and barbecues! Chop, grate, prepare and measure the broccoli, red onions, bacon, cheese and sunflower seeds. Toss together in a large mixing bowl. Whisk together the ingredients for the dressing and pour it over the broccoli salad. Mix well and refrigerate for at least 4 hours.